While its sports coupes are more of a known entity, the i8 Concept shown in Frankfurt today may be the most radical coupe BMW has ever built. Its “stream flow” lines, characteristic of the new BMW ‘I’ sub-brand, include an adaptation of the BMW twin-kidney grille and extremely slim LED headlamps. The roof is transparent, as are portions of the side of the car. The carbon-fiber reinforced plastic “Life” passenger cell is visually distinct from the “Drive” mechanical portions of the car with both color and accent lines. The shape is a fairly close adaptation of the BMW Vision EfficientDynamics vehicle first shown in September 2009 at the Frankfurt Motor Show. A lithium-ion battery pack is housed in the tunnel between the passenger seats and powers a 96-kilowatt (131-horsepower) electric motor between the front wheels. The pack capacity is smaller than that of the all-electric i3, but BMW did not provide energy capacity figures. Like the i3, the i8 plugs in to recharge, with less than two hours needed for a full recharge on 240-Volt power. The i8 Concept offers an all-electric range of up to 20 miles, though most likely at city speeds rather than high-speed driving. This will allow its drivers to enter and travel through future zero-emissions city cores, by switching to electric-only mode, before reverting to gasoline operation in less urban areas. After that, the 223-hp,1.5-liter, turbocharged three-cylinder gasoline engine between the rear wheels switches on. While it drives the wheels mechanically through a conventional transmission, it also has a high-voltage alternator that can recharge the battery pack if needed. Acceleration from 0 to 62 mph is given as 5.9 seconds—roughly equivalent to the 2012 Fisker Karma extended-range electric sports sedan that just went on sale. With a weight around 3260 pounds, the i8 is limited to a top speed of 155 mph. 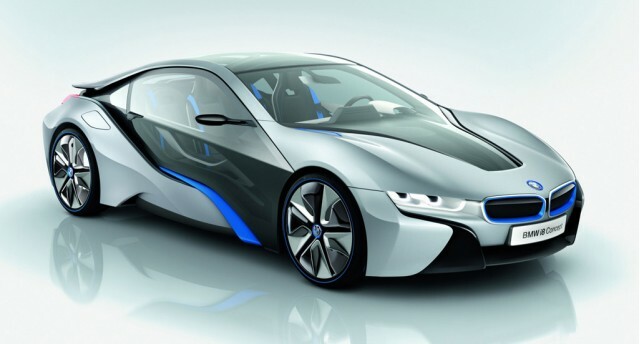 BMW did not reveal a price or schedule for the i8 sports coupe, though it will likely arrive slightly after the i3 urban electric vehicle—which is expected to go on sale during 2013 as a 2014 model. BMW provided airfare, lodging, and meals to enable High Gear Media to bring you this first-person news report.